Mark Andrews, Development Chef from bartlett mitchell recently pitted himself against eleven top chefs from across the globe to compete head-to-head in the PEI Garland Canada International Chef Challenge. Chefs cooked a shellfish dish with Prince Edward Island Shellfish as the main ingredient, in front of a live audience and panel of celebrity judges. Mark’s blog shares his experience of this incredible place and competition. I looked out of the aeroplane window as I left the PEI Garland Canada International Chef Challenge, and I reflected on the mammoth victory. 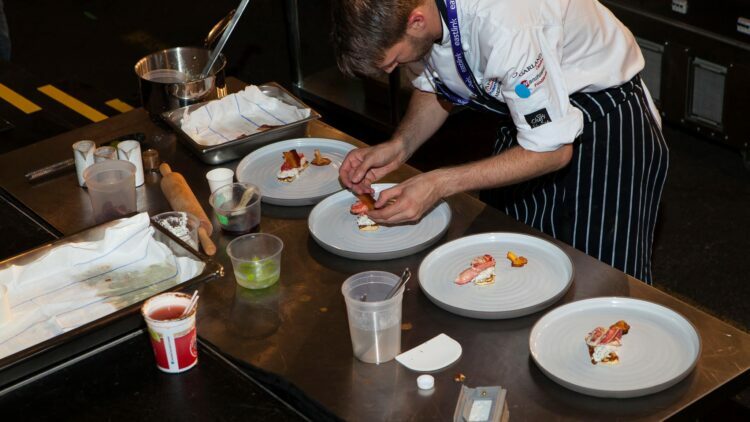 Not because I was the runner-up, but I was victorious about the bond twelve chefs from across the world had formed. Each of us had very different food styles and food philosophies, yet we all spoke the same language. It wasn’t English/American, but it was how we conversed about food, kitchens and restaurants. We had an opportunity to excel in culinary companionship. I was amazed how quickly we formed bonds. I don’t use the word companionship lightly. It wasn’t just moral support, we shared our ideas and together we brainstormed to make each others dishes even better. In the first round, Andrew McLeod, (this year’s eventual champion), had the foresight to fit in a knife roll, which he brought in a small water circulator. I felt this wasn’t fair at the time, however he then offered it to me for the next round! This helped me get through to the final because the dish couldn’t have been successful without it. 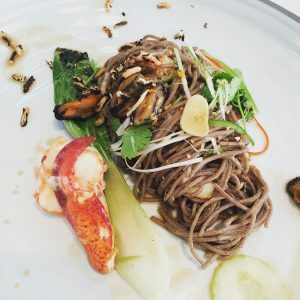 My first round dish had an Asian influence using lobster prepared in a butter poach, soba noodles dressed with crab, finished with a mussel, soy and ginger dressing. I felt this was my strongest dish. On the first evening we met Alicia Birt, our host, and Liam Dolan, Founder and Chair of the 2016 PEI International Shellfish Festival. Their empathy and understanding were exceptional. The next day we headed to the Culinary Institute of Canada for a briefing by Kevin Boyce. Kevin organised and judged the competition. We had a guided tour by Kaley Macdonald, Seafood Marketing Officer for the Prince Edward Island. Kaley told us that PEI produces 48 million pounds of mussels, which equates to 80% of Northern America’s consumption. I never knew the colour variation in a cooked mussel was due to its gender. Prince Edward Island produces up to 27 million pounds of lobster a year. That is a lot of rubber bands! We stopped for lunch at Raspberry Point oyster farm. Jason Nagy, one of the other competitors effortlessly shucked fresh oysters for us. He shucked a dozen oysters in under a minute, which is an average of 5 seconds per oyster. Jason went on to come second in the Festival shucking competition. We watched Raspberry Point’s oyster sorting machine, which photographs and measures each oyster and sorts them into size, processing 10,000 oysters in 1 hour. Day two was the first heat of the competition. I was in the first heat of six chefs, and we had staggered starts, so the judges could eat one dish at a time. Looking back on my dish, I was reasonably happy, although I don’t remember seeing anyone else’s. My adrenalin levels were high, although I would later learn that it was nothing compared to the final! I successfully made it to the semi-final heat of the PEI Garland Canada International Chef Challenge with six other chefs. In my mind this was a great achievement and all of us could walk away with our heads held high. The hospitality offered by PEI and Garland was amazing! All twelve contestants were treated like rock stars! I especially liked the engraved Japanese knives each chef received after the first round! Later that day we went on a lobster boat trip, it was a cool and clear night. I started thinking about my next dish, bear in mind I had travelled to Canada with only one dish ready planned. I asked Andrew McLeod if I could use his circulator and he said “yes, of course”. Andrew was happy to share it with all of us, but I was glad I asked first! In the next round, we both used the circulator to cook an egg, but at different temperatures. We both had very successful results. I discussed my dish with Pete Redman, our Chef Director and he reigned me in a bit. That may have made the difference. 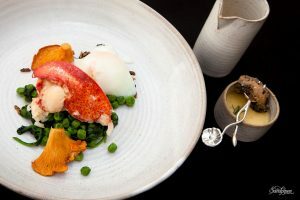 I served a poached lobster with a crumbed mussel and almost burnt cream, slow-cooked hens egg, and a lobster, crab and saffron jus. All the chefs gave me positive vibes and said they felt it was a ‘finalist’s dish’! Even Andrew McLeod said, “If you knock me out, you have to dedicate it to me!” I didn’t need to, as we both made it to the final. At this point winning and coming runner up meant the same for me. I never in my wildest dreams thought I would make it this far. And now I was back to the drawing board devising my final dish. But first I had my first interview with CBC radio. That evening was party night. Two tribute acts and the festival was in full swing. There must have been at least a 1000 people getting into the party spirit and twelve chefs enjoying themselves. I wanted to produce a dish with both Canadian and English elements, suddenly the idea came to me! I also had a back-story and felt good about a few techniques I could show. During the evening Devon Latte, one of my co-competitors said, ” Dude what are you doing? You’re in the final, get to the hotel and get some rest”. I replied simply, ” There’s no way I am going back to rest, I want to make every minute count”. I think Devon understood me when I said, “To get this far, and in my mind, I have already won”. The final – don’t miss the last part of Mark’s blog about the PEI Garland Canada International Chef Challenge which will be published next week. You can read more about Mark’s achievement in the news section.